Westport Winery released three exciting new wines this week at their tasting rooms in Aberdeen, Washington and Seaside, Oregon. True Blue is their first varietal Malbec for this family-owned operation. The fruit, grown at the acclaimed Sugarloaf Vineyard in the Rattlesnake Hills AVA, is what they consider one of their top picks from 2017. Joe Hattrup, owner of both Sugarloaf and Elephant Mountain Vineyards, has become one of the primary grape growers for this coastal winery. The Roberts family who founded Westport Winery in 2008 wanted grapes from these vineyards for years before finally getting the opportunity as the fruit is in such demand among the top wine producers in the state. True Blue is a name that has been in the tasting notes before but with it now being Malbec the family felt it warranted a new label. They reached out to their friend Darryl Easter, one of Blain Roberts’ surf partners, whose watercolors grace a dozen of their other wines. Blain told him the story of how he moved to Maui in 1974 with $400 and a car big enough to sleep in since there was a housing shortage on the island. 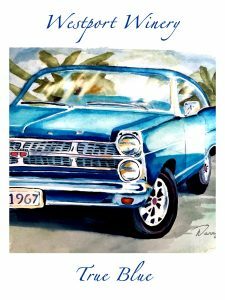 This new label features the 1967 Ford Fairlane that helped launch Blain’s career to eventually become the owner of Lahaina Divers. A portion of the proceeds from each of Westport’s wines benefits a local charity. True Blue contributes to North Beach PAWS in Ocean Shores. To date, the Roberts have donated over $500,000 to over forty local organizations including two in Seaside, Oregon, plus Mercy Ships, an international hospital ship serving areas in Africa. The winery also released their 2018 vintage of Willapa White a balanced blend of Riesling and Pinot Gris, again with grapes grown at Hattrup Farms. Plus, they released the latest vintage of Night Watch their blend of Mouvedre, Grenache, Petite Sirah with sweet dark chocolate with grapes exclusively from Sugarloaf and Elephant Mountain Vineyards. These three new selections are available in either of their two locations. Additionally, all the wines are listed on their website with the ability to ship to over twenty-five states. Westport Winery Seaside received the 2019 Rising Star Award from the Seaside Chamber of Commerce. Westport Winery and the Roberts family were honored with Seattle Business Magazine’s Community Involvement Business of the Year for 2018. In 2017 the Westport Winery Garden Resort was named Greater Grays Harbor Business of the Year. USA Today named the Sea Glass Grill at Westport Winery Garden Resort one of the top five winery restaurants in the nation. The business has been voted Best Winery by King 5 Evening Magazine.